Whether its your first tattoo or the hundredth. All tattoos need to be cared for in order to protect the ink and prevent infections. In this article we will be going over the essential steps needed to promote fast healing while caring for new tattoos. When it comes to how long it actually takes for someone to heal. We can only provide a general guide as to what you should expect. Everyone has different healing factors from one another. So the time it takes for you to heal can be different from your friends and family. Other factors that can impact how long it takes. Can include the location on the body in which the tattoo has been done. As well as where you live and the time of year in which you had the tattoo done. A hot and dry summer’s day can dry out your tattoo, or high humidity could cause you to sweat more. Similar things can also occur during the frigid winter months and around snow. Please use our suggestions as guides as you could heal faster or take longer then expected. From when the skin is first punctured by the needle, to when the last scab and flake of skin has peeled away. Everyone goes through the same stages of healing and will require the same level of aftercare. Your tattoo artist has just finished their work. Now they have placed a clingfilm bandage over your tattoo. This is an important process as the tattoo is like a open wound at this stage which is at a higher risk of infection. Keep this bandage on for as long as the artist has advised. This could be just a couple of hours or even as long a 24 hours. This bandage will help to prevent the tattoo from drying out and keep it sterile until you can start caring for it. For this reason keep the bandage on longer then just a few hours, if you will not able able to clean it straight away and allow it to dry. When you are able to remove this bandage it is very important that you clean the tattoo right away. In the time since the bandage was applied. It has been weeping and oozing blood, plasma, and ink fluids. This needs to be cleaned off now that it has been exposed to air. The sterile seal that was keeping bacteria out has been removed and now they will start to flourish again. After washing your hands, remove the bandage and discard it in the bin. Soap up the lukewarm water by rubbing the soap in it. Using your fingers, gently work in small circles and apply the soapy water to your tattoo. Do not scratch or pick at clots on the tattoo as they may be scabs already forming over open sores. Any fluids that have pooled away from any open sores should dissolve with the water. Remove any clots that have formed on the skin away from the tattoo itself. Cupping fresh water in your hand(s), rinse the tattoo after it has been cleaned. Allow the tattoo to air dry or pat it dry with a paper towel. DO NOT RUB IT DRY. After it has dried apply some non-scented anti-bacterial cream and gently work it into the tattoo. Do not use too much cream as the skin needs to breath. Only use enough that can be absorbed by your skin while also keeping the area moist and glossy. Coarse towels, wash cloths, or sponges. As they can scrub the healing scabs away, cause further bleeding or even tearing around the sensitive skin. Petroleum-based creams or products as the can clog the pores and prevent healing. Do not re-wrap the tattoo, you must allow it to breath. Do not soak the tattoo, use hot water, or place it under running water. Under no circumstances should you scratch at it, pick at it or apply firm friction to it. Do not press fabric or clothing to the tattoo. When the fluids it weeps dry out. They will bond with the fabric causing it to rip the scabs off when its removed. Moisturizer if the tattoo is still wet with water. The water will prevent the skin from absorbing the moisturizer. 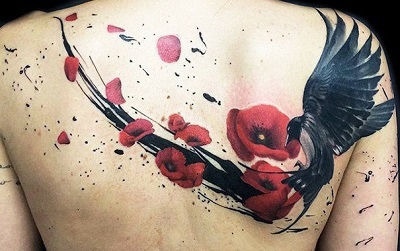 For the first 24 – 48 hours after the tattoo has been done. There will be continued weeping and oozing of a mixture of blood, plasma and ink. These fluids will eventually form scabs that seal in the inks allowing for the healing process to truly begin. Do not pick at any scabs that have formed as this can pull ink out of the skin. The skin will still be irritated from getting the tattoo. It may be red around the edges of the tattoo, and the skin may be slightly raised and swollen and tender to the touch. There could be some bruising around the tattoo. If you are not easily bruised, this could be from either the artist being heavy handed. Or an area required a lot of going over such as a large amount of color filling was needed. This is all normal and may last up to a week. The body is merely responding to the trauma of the needle injecting ink beneath the epidermis. Continue to clean and moisturize your tattoo 2-3 times a day. Avoid sun exposure, as it can bleach the ink. Even when healed always use sun screen. Wear clean lose fitting clothing. Tight clothes can irritate your tattoo. Do not soak your tattoo in water. This includes swimming. Have quick showers, not too hot. Only clean the tattoo with your fingers/hands and not sponges or cloths. Avoid strenuous activity if its going to put pressure on the skin around your tattoo. Excessive weeping, bleeding and oozing continues beyond 48 hours after receiving the tattoo. There’s a smell or change in the color of the discharged fluids. The swelling has continued to increase after 48 hours or its not just confined to the tattoo itself. The area is extremely sore to touch. Then you may need to get medical attention and should have it checked out ASAP. Do not pick at scabs or pull away peeling skin. Ensure that the tattoo is well moisturized. Use an anti-bacterial cream for as long as scabbing persists. If there are no scabs, other moisturizers and salves can be used. Skin will fall away on its own. No its not your tattoo rubbing off. Do not scratch that itch. Yes it is the disgusting part about tattoos. By now, should you have been cleaning and moisturizing your tattoo correctly. Your tattoo should be healing nicely. Now is the time of yuck! As your tattoo heals, it will begin to scab over. These scabs won’t necessarily be large lumpy scabs akin to the type you would see following a cut that’s healed over. Scabs are a healthy indicator that the tattoo is healing nicely and could also be the hardening of the skin in the same shape and/or color of the tattoo. If you see ink in the scab tissue itself, that’s perfectly fine. A good artist would pack as much ink into the area as possible and the excess would seep out before the rest is sealed in. Keep the tattoo well moisturized (2-3 times per day) and don’t let the scabs dry out too much as they could prematurely fall off. Let your scabs fall off naturally and not pick at them. Doing so could delay the healing process as well as remove ink from within the dermis. At around 1-2 weeks, the tattoo will begin to crack and peel. This is due to the skin over the tattoo drying out and making way for the healthier layer of the epidermis to start coming through. The tattoo could start to look like a dried out piece of snake skin. Or begin to peel in large clumps like sun burnt skin after too much sun exposure. Or it could be so fine that you wouldn’t notice it at all. If your tattoo starts to itch, that’s a clear indicator that the skin is starting to peel away. Itching can’t be avoided but it can be lessened. All you need to do is to keep your tattoo well moisturized. If it’s unbearably itchy do not scratch it at it what so ever. Instead moisturize in more often. Maybe as much as 6-7 times a day instead of the 2-3. The itching is caused by the skin drying out and pulling away from the under layer. If there is no more scabbing, you can change your moisturizer from a non-scented anti-bacterial to something like a coconut oil. There are also creams specially made to help deal with the itching that comes with getting a tattoo. These could be more beneficial for yourself. As tempting as it is to pull away the peeling skin, you must resist doing so. Just like pulling away a scab prematurely. Pulling away peeling skin can delay the healing process as well as pull ink away from the skin. When cleaning the tattoo or applying the moisturizer. Continue to use only your hand or fingers and gently work the moisturizer in. Do not use a coarse cloth, towel or sponge to clean the tattoo as this will pull the skin away. If the skin falls away in the shower that is perfectly fine as long as you are not putting the the tattoo directly under the shower head. Skin peeling away from over the skin surrounding the tattoo will look normal. Skin from over the tattoo itself will be colored from the ink. As long as you’ve made it through the terrible itching phase without scratching up your tattoo. Most if not all of the scabs and flaky skin would have dropped off. If there are still some scabs left over from some of the more heavier scabs. That’s perfectly fine and nothing to worry about, as they will fall off soon enough. The tattoo itself may still require further moisturizing. As the skin my be slightly dry and even a little sore to the touch. Continue to moisturize when ever your skin looks or feels dry to the touch. There will be a fine layer of scar tissue that covers the tattoo. It can make your tattoo look dull if not cloudy, or even reflective at certain angles. This is perfectly normal and once your skin has completely recovered from the trauma its undergone only a month a go. This protective layer with flake away on its own over the next couple of months. Now is a good time to check for any needed touch ups. If there are any signs of fading, patchy spots of distortion. Contact your artist to arrange for the corrections to be carried out. Keep your tattoo out of direct sun light. The skin is still new and vulnerable. Use sun screen when going outside during the day. You can now have soak the tattoo in water and go for swims. Keep the exposure low as the skin swelling with water can still cause damage to your tattoo. Coarse towels, wash cloths and sponges can now be lightly used over your tattoo. Do not use heavy exfoliation brushes or excessively scrub the tattoo. By now your vibrant and colorful tattoo should have made its was to the surface. The deeper layers of skins would be close to recovered. Sometimes it can take up to 6 months for the skin to fully recover. For this reason some people may find that muscles beneath the tattoo are sore to use. This should pass over time. All the dead skin has fallen away and all the scabs have fallen off. Now its time to show off that ink to your hearts content. So does that mean that there’s nothing more for you to do to look after your tattoo? Tattoos need to be protected from UV light as the light can fade/bleach the ink. Sun burns and blistering caused by the sun, can result in the tattoo being distorted and damaged. When ever you go out into the sun you need to use sunscreen to help protect your tattoos vibrant colors or solid shades. Misshaping can also occur from excess weight gain or muscle growth/loss. If you wish for your tattoos to retain their shape its best to have them placed in areas of the body that aren’t as likely to be affected by changes that come with age or lifestyles. Tattoos are permanent and will become an extension of your skin. So good skin care is need to help protect and extend the vibrancy of your tattoos.